Colour me confused but I wasn't quite sure who to expect next to come through the front doors. Yosemite Sam claiming "there's gold in them thar hills" or Elliot Ness armed to the teeth and prepped to bring down the shutters on a raunchy speakeasy? 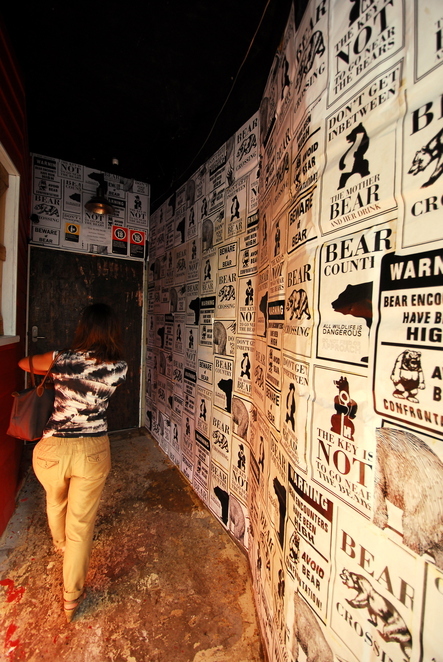 The Blind Bear is a bar/diner whose clandestine entrance has all the hallmarks of stepping into an illegal Chicago drinking den circa early 30s. A narrow portal is chiselled between 2 shops and leads to a chunky wooden door that seems to enclose secrets of the murky kind. The only hint of any activity behind was the muffled sounds of 1920s Robert Johnson blues. Once inside and the ambience almost writes its own script. I felt like an extra in a film set in the Klondike gold rush days. However this tiny enterprise digs much deeper than kitschy theme. The extra ingredient is a heavy hit of highbrow cool. Exposed brick walls bookend furniture using timber pallets as their cornerstone. Disused kegs are your tables and stools perch against a bar tended by a bearded barman who with a few more years and kilos could double as Grizzly Adams. That barman, as it turned out, is one of the owners. Garage sale furniture becomes high brow cool. Ben Lewis is a good Aussie boy who has spent more than his fair share of time in the States. On repatriating himself, he teamed up with old mate Anthony Canturi and together fostered an idea. Voila the Blind Bear. I queried Anthony on what exactly was that idea in creating this most eclectic of establishments. "We're trying to bring to Cronulla the sense of the small bar hospitality so prominent in the city". Reading between the lines, I guess the 2 of them are attempting to provide an alternative to the stereotype that Cronulla is "burbs by the beach". How have they done that? Apart from the physical facade, the pair has mixed a range of quirks with a chic take on the two staples of a restaurant/bar – food and beverage. Four taps provide draught brews in a daily state of flux. All beers are Australian craft and rotate regularly. Even the labels on the taps are written on cardboard to keep pace with the flexibility. I plumped for the Red Rock organic pale ale – yes, like a party in my mouth and everyone invited. As for the wines, you won't be confused. They also rotate but there will only ever be 3 available on any given night, one of each colour and a sparkling. All are upper shelf and the white I sampled was a pleasantly soft Pinot Gris. Bite size burger snacks and craft tap beer. The grub? Ben has imported Lenninn, his larger than life buddy from the kitchens of New York. It's tough to pigeon hole the menu but it's a kind of edgy take on US working class diner standards. Hot dogs anyone? Dispel your ideas of packet frankfurts served on a rubber bun and smothered with ketchup and mustard. Think all beef smoky homemade chilli con carne garnished with all the fresh trimmings on your classic dawg. Throw in burgers, shrimp, hoagies etc plus some charcuterie and mezze for that light infusion of France and Middle East. Got the idea? Enigmatic. Overlaying the whole scenario was the sound of early 20th century blues. However even that's no given. On my friend's visit a couple of nights earlier it was swinging vibes straight from the 60s airwaves. Almost intentionally unfashionable, I wonder if Ben and Anthony like to keep the patrons guessing. And those patrons are coming. This is a recently fledged operation that only opened its doors a month or so back with no advertising fanfare and not even a sign out the front – blink and you will miss it. Yet arrive after dinner and the line snakes down the Cronulla Mall. 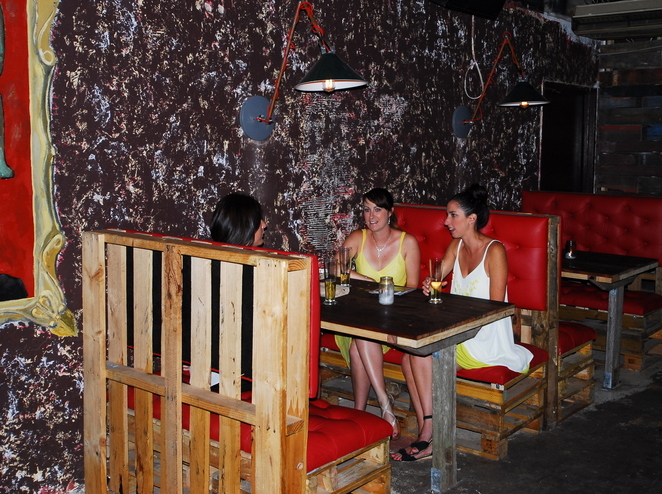 The Blind Bear has already registered a solid blip on the hospitality radar. The human capacity is capped at 60, read: arrive early or expect a wait. What does that tell you? There is a market for left field hospitality down on the southern beaches. I love this place and its ambitions. It is hole in the wall places like this and quite a few other venues that have taken root that are ratcheting up the edge, putting some starch into Cronulla's image makeover. When: Wednesday to Sunday 4pm til 10pm. Where: 28 Cronulla St Cronulla. Look closely for a lone door at the end of a passageway in the middle of Cronulla St Mall. I loved your article and your writing style. I look forward to reading more of your work.